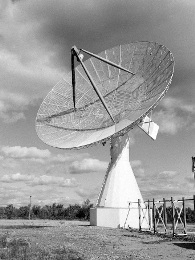 Kennedy antenna dish used by the CRC to receive telemetry from the ISIS satellites in the 1960s. For over 40 years, the CRC has responded to a broad range of telecommunications challenges and opportunities unique to Canada's telecommunications landscape. From antennas to algorithms, broadcast to broadband, and satellites to software—the CRC has played a critical role in charting Canada's course in communications. 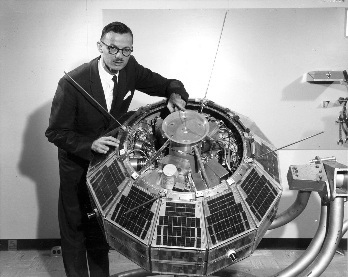 Canada's first satellite, Alouette 1, was largely designed, built and tested at the CRC's Shirleys Bay Campus. Dr. John Chapman reveals the internal electronics of the satellite in 1962. For example, CRC's early satellite research led to the development of communications satellites used in broadcasting, search and rescue, and other applications serving Canadians today. CRC was the site of the first international terrestrial connection to ARPANET, precursor of the Internet. CRC's discovery of photosensitivity in optical fibre led to the establishment of high-speed Internet and spurred the growth of Canada's optical communications industry. CRC research and testing were instrumental in the adoption of North America's digital television standard. More recently, CRC research was fundamental to establishing new loudness control standards for TV broadcasting. Just as the Alouette satellite pioneers positioned Canada in space, a similar pioneering spirit is needed today, to navigate our nation through the coming era when demand for radio frequency (RF) spectrum puts pressure on its supply. The proliferation of mobile devices running bandwidth-hungry applications is putting pressure on this finite resource. A shortage could jeopardize not only personal and business communications, but public safety communications as well. Technological solutions can help address the heavy demands being placed on spectrum. CRC's expertise lies in the wireless technologies and techniques of tomorrow that are adept at sharing spectrum, mitigating interference, optimizing interoperability and overall, capitalizing on this valuable resource. Fundamental to the future are CRC's advice and support to Innovation, Science and Economic Development Canada, which manages spectrum, and to other government departments that rely heavily on wireless communications. Also important is our relationship with industry, academia and other research institutes for by working collaboratively, Canada will be better positioned to overcome the spectrum challenges on the horizon. Wireless communication is revolutionizing the way we speak to each other, conduct business and organize our lives. Today, smartphones, GPS devices and wireless Internet connections are as indispensable as they are commonplace. Our reliance on wireless communication will only increase in the future. In fact, experts believe that by 2020, mobile data traffic will likely be 1,000 times what it is today! At the Communications Research Centre (CRC), we recognize that this rapid growth in the use of mobile services poses a major challenge—the supply of radio frequency spectrum used to support wireless communication is limited. But it also presents a great opportunity. In Canada alone, the wireless industry contributes an estimated $50 billion to the economy, supports some 280,000 jobs, and inspires the innovation of new products and services. As an integral component of Innovation, Science and Economic Development Canada and its Spectrum and Telecommunications Sector, the CRC is ideally positioned to meet the challenges, so that Canadians can realize the opportunities offered by the growing use of wireless communication. Since 1969, we have been Canada's primary advanced telecommunications applied research centre, working closely with partners in government, the private sector and academia. In 2017, we opened the Big Data Analytics Centre, a state-of-the-art research lab with visualization tools that will allow us to perform leading-edge research. As Canada's federal centre of excellence for wireless telecommunications R&D, be a leading contributor to solutions for wireless demand in a modern economy. Take part in strategic R&D collaborations that leverage CRC's activities, resulting in knowledge and technology transfer, to the benefit of Canadian industry, the economy and Canadians. CRC is the federal government's primary laboratory for research and development in wireless technologies. It is a client-driven, applied research centre providing technical advice and support to Innovation, Science and Economic Development Canada's Spectrum and Telecommunications Sector, the Department of National Defence, Public Safety Canada and other government organizations. When these clients address key national priorities, they use CRC's independent and impartial research to support their policy, regulatory and technical decisions. Along with supporting government, CRC collaborates with industry, universities, and other research institutes on common goals. There has been an explosion in demand for wireless broadband services. But the conduits carrying these services—communications networks—use a finite resource: radio frequency spectrum. Whether emerging technologies could disrupt existing technologies, and require regulatory change in the process. To help ISED answer such questions, CRC conducts research spanning the range of its expertise: from the fundamentals of wireless technology; to the next stage of development, namely networks and systems; to the final phase encompassing applications, prototype development and performance. CRC provides ISED with deep technical knowledge and recommendations to support key wireless drivers such as harmonization, economies of scale and interoperability. CRC actively supports and represents ISED at international standard-setting bodies, such as the Institute of Electrical and Electronics Engineers (IEEE). While the private sector plays a central role in investing in innovation, ISED leverages CRC R&D as one means of encouraging investment. Researchers from CRC collaborate with their counterparts in industry, academia and other research organizations to both advance the efficient use of spectrum, and provide flexible access to this resource in order to create opportunities for Canadian companies. From domestic disasters to multi-national missions abroad, Canada's military relies on robust and secure wireless communications. CRC works with the Department of National Defence (DND) and its research arm, Defence Research and Development Canada (DRDC), to provide improved operational capabilities to the Canadian Forces. Managing voice and data traffic flow. CRC is also capitalizing on opportunities presented by emerging communications technologies. Highly adaptive agile radios, for example, offer opportunities for more effective use of radio spectrum that are needed to satisfy the growing requirements for increased information flow in networked mobile operational environments. CRC works on behalf of DND-DRDC with allied organizations and international standards bodies, including working groups of the North Atlantic Treaty Organization (NATO) and The Technical Cooperation Program (TTCP). These collaborations stimulate leveraging of the R&D and the S&T knowledge of our allies. As well, CRC's technical contributions help ensure that Canada's interests are reflected in any new standards related to interoperability, higher performance and robustness of radio communications networks. Effective communication is critical to public safety, national security and emergency preparedness agencies. Saving lives can depend on the ability of emergency responders to communicate. significant research toward a complete rethinking of radio design, so future equipment is not affected by interoperability problems. Interoperability issues arise when multiple forces respond to a crisis or disaster. Consider large-scale emergencies drawing on resources from across regions. As various fire, ambulance and police forces converge with their respective radios, they may not be able to communicate via distinct technologies. 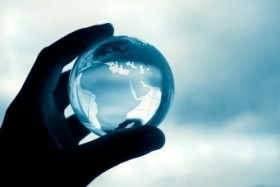 At the network level, common standards and protocols are the most practical solutions. At the device level, a solution is software defined radio (SDR) technology. SDR transfers modulation and frequency functions from radio hardware to software, allowing radios to modify their mode of operation as required, without hardware changes. This revolutionary approach is likely to significantly alter how radios have been used since their inception over 100 years ago. Along with supporting government, CRC collaborates with industry, universities and other research institutes in pursuit of common goals. In the past five years, CRC has counted among its clients 160 companies, 20 universities and 20 research institutes. 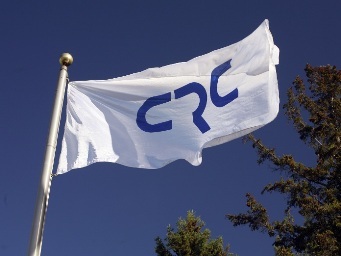 Clients come to CRC because it is the only Canadian facility with the capability to create communication technology innovation starting from basic science, all the way through to prototype development and field deployment (testing), effectively covering all aspects of the technology innovation chain. The examples are varied. Academic researchers in Canada and around the world are investigating interference with CORAL, the world's first Wi-Fi-based cognitive radio development platform, developed by CRC. One leading Canadian company approached CRC for help in the design and enhancement of multi-antenna handsets. The company came to CRC given our cognitive radio experience, involvement in IEEE standards and expertise in wireless circuits and antenna systems. In another case, a Canada telecommunications carrier was exploring the possibility of building a wireless business case. It contracted with CRC to perform wireless product performance analyses and network design research. In performing this research, CRC experts used their extensive test bed infrastructure. In 2012, for instance, CRC collaborated with an industry partner to add an LTE network to its existing wireless test network, covering more than 100 km2 in the west end of Ottawa. This is one of the first LTE wireless test networks of its kind in North America. CRC operates the test network to study the performance and capabilities of a wide variety of emerging wireless technologies, specifically to develop network design and optimization techniques, refine wireless coverage models, and assess application performance and scalability. Dr. Jean Luc Bérubé joined the Communications Research Centre (CRC) in 2009 as a research vice-president and became President of the CRC in 2011. He brought with him a proven track record in managing the human and technological issues inherent in complex telecommunications R&D. Dr. Bérubé lead the CRC through significant transformation, including rejuvenating and realigning the research programs, re-engineering the CRC's corporate processes, and modernizing laboratory and campus infrastructure. These efforts have positioned the CRC as an agile, innovative, and client-driven applied research centre for advanced wireless telecommunications. You can learn more about the research the CRC conducts under Dr. Bérubé here. Dr. Bérubé began his career as a design engineer with Canadian Marconi Company. He later joined Nortel, leading teams in the design of advanced telecommunications equipment. He then moved to Motorola, where he ensured that product planning and customer needs were tightly aligned, and from there joined Altera Corporation, where he oversaw both applications and market development for the Canadian wireless and broadband network communications sectors. Dr. Bérubé holds a Bachelor of Science degree from the University of New Brunswick (UNB), a Master of Applied Science degree from Montréal's École Polytechnique, and a doctorate from UNB, all in electrical engineering. Ms. Colette Jubinville is Executive Vice-President, Business Development and Corporate Affairs. She joined the CRC in 2011. Before moving to the CRC, Ms. Jubinville worked in several sectors of Innovation, Science and Economic Development Canada (ISED) in policy, advisory, managerial and executive roles. Her extensive knowledge of the Department has proven to be instrumental in aligning the CRC's direction with ISED priorities. Ms. Jubinville has a Master of Arts degree (Philosophy) from the University of Ottawa, and an Executive Master of Business Administration degree from McGill University and École des hautes études commerciales. Dr. John Lodge is Chief Technology Officer (CTO) of the CRC. He assumed the CTO position in 2014, after serving as a research vice-president for several years, and before that, as a research director. Beginning in the 1980s, Dr. Lodge built and led a renowned team of experts in the field of communications signal processing. Their work at CRC has long served Innovation, Science and Economic Development Canada (ISED). Under his leadership, CRC's signal processing team established an international reputation for excellence in areas including modulation, error control coding, and synchronization for satellite and mobile wireless telecommunications. Along with ongoing support of government programs, extensive technology transfer to industry occurred through both licensing of intellectual property and contracting activities. For many years, Dr. Lodge managed CRC's primary research and development program for radio spectrum monitoring and signal surveillance. Collectively known as Spectrum Explorer®, the resulting suite of technologies has been used experimentally and operationally by many government organizations and Canadian companies. There are more than 50 Spectrum Explorer® units currently in operation across the country helping ISED manage Canada's radio spectrum. Dr. Lodge has been an adjunct professor at the University of Ottawa, the University of Manitoba and Concordia University. He also served on the Strategic Projects Selection Panel for Information Technologies of the Natural Sciences and Engineering Research Council of Canada, and chaired the panel in his final year of service. Dr. Lodge is a fellow of the Engineering Institute of Canada (EIC) and of the Institute of Electrical and Electronics Engineers (IEEE). His awards include IEEE Canada's Outstanding Engineer Award. He received his Doctorate (Electrical Engineering) from Queen's University and after working for three years in the industry, he joined CRC. Mr. Stéphane Gagnon is Vice-President of the CRC's Applications and Performance branch. He joined the organization in 2015, bringing to it over 20 years of experience in the telecommunications and semiconductor fields. Prior to joining the CRC, Mr. Gagnon was Chief Operating Officer for POET Technologies. Earlier, he worked at Integrated Device Technology, formerly Tundra Semiconductor, Motorola, and Nortel (Bell Northern Research), where he progressed through several director and senior director positions. He was also chairman of the non-profit RapidIO Trade Association Steering Committee for three years, and a contributor to the working group for over nine years. He has collaborated with NASA, the U.S. Department of Defense and many industry players such as Ericsson, Nokia-Siemens and Huawei. Mr. Gagnon's skill set is rich in leading research and development activities, in directing cross-functional teams, and in managing international customer and partner relationships. He has a strong background in pioneering technologies and innovations in wireless telecommunications. With his extensive knowledge of trends, issues and risks in this field, he is able to leverage his know-how to bring together innovation, development, design and industry stakeholders. Mr. Gagnon holds a BSc in Computer Engineering from Laval University. Mr. Marc Levesque is Vice-President of the CRC's Wireless Technologies branch. He joined the CRC in 2015, with over 20 years of experience spanning engineering, technical sales, business development and management. Mr. Levesque joined the CRC from Altera Corporation, where he served as a Global Account Manager, leading an international team focusing on telecommunications customers. Earlier in his career, he worked in various engineering capacities—including hardware design, software development, system verification and field support—for companies supplying telecommunications equipment, such as Nortel. This experience in research and development (R&D) formed the engineering base that propelled him into technical sales, business development and senior management. It also provided him with an in-depth understanding of guiding scientific principles that he applies in R&D team leadership today. Mr. Levesque also brings to the CRC a strong track record interfacing with stakeholders, from internal experts tackling technical issues and team members managing business functions, to external collaborators and global clients. Mr. Levesque has a BSc in Electrical Engineering from the University of New Brunswick and a Master's Degree in Engineering Management from the University of Ottawa. He is a Professional Engineer with the Association of Professional Engineers of Ontario. Take the Queensway (417 West) and exit at Moodie Drive. Turn right on Moodie and follow it to Carling Avenue. Turn left on Carling and proceed to the second set of traffic lights, just before the railway overpass. At these lights, turn right onto the access road leading to CRC. Take West Hunt Club Road and follow it to Moodie Drive. Turn right on Moodie and follow it to Carling Avenue. Turn left on Carling and proceed to the second set of traffic lights, just before the railway overpass. At these lights, turn right onto the access road leading to CRC. The CRC is a secure site that requires visitors to be escorted while on the premises. On arrival, you will be greeted by security staff who will issue you a visitor pass and then phone the person or party you will be visiting. A representative will then meet you, either at the guard house, or at the entrance of the appropriate building.